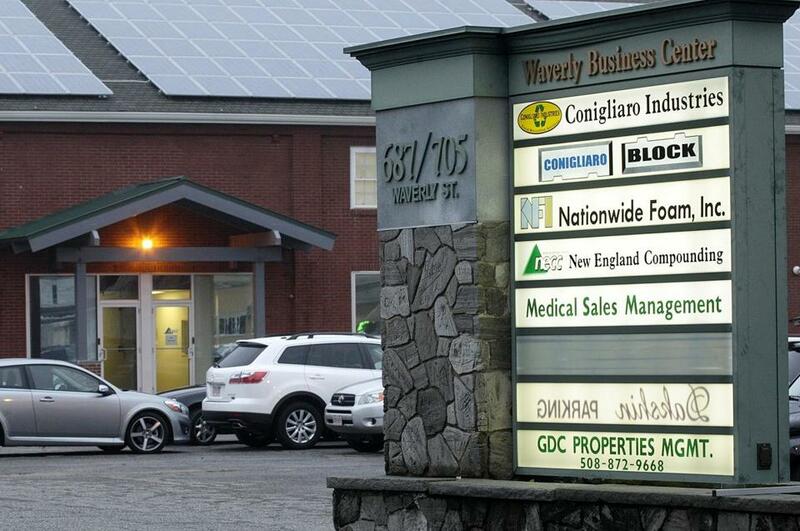 A sign in front of the Waverly Business Center lists the New England Compounding Center and other business owned by the Cadden and Conigliaro families. The compounding center is linked to the fatal meningitis outbreak. KINGSTON, R.I. — The Massachusetts specialty pharmacy at the center of the deadly national outbreak of meningitis might not have existed but for a relationship that started about three decades ago on the bucolic campus of the University of Rhode Island. Barry Cadden and Lisa Conigliaro were classmates in the school’s College of Pharmacy, two of 92 students who graduated in the class of 1990. ­Cadden was following a family tradition: His father was a local pharmacist and an alumnus of this state university. Conigliaro came from a family with a strong entrepreneurial bent. They would fall in love and, within a few years of graduating, marry. It would be more than a wedding of two licensed pharmacists. A special alliance would evolve between Cadden and his wife’s older brother, Gregory Conigliaro, a go-getter with an eye for niche businesses. Together, they started New England Compounding Center in Framingham, as well as Ameridose, and turned them into some of the fastest-growing drug-compounding businesses in the country. With Cadden’s scientific know-how and Gregory Conigliaro’s enterprising spirit, their fortunes grew. They launched a half-dozen related corporations and brought in relatives, including Lisa, as ­employees and corporate officers. Together with their wives, each built handsome homes in Massachusetts, bought vacation homes, and gave generously to their favorite charities or political causes. The creative energy of the two families seemed unstoppable, until last month, when public health authorities linked an outbreak of fungal meningitis around the country to one of their injectable steroids. Several hospitals have begun notifying hundreds of cardiac patients they received a heart medication produced by the Framingham pharmacy linked to the national outbreak. Now New England Compounding is blamed for potentially exposing thousands of ­patients to contaminated products. So far, 19 people have died, and more than 200 people have become ill.
Cadden, 45, and Conigliaro, 46, and their extended families have declined comment since the outbreak began and have remained mainly out of public view. Many of their colleagues and friends also are not speaking. A spokesman for their businesses also declined comment Wednesday. But public records and interviews with former employees and neighbors reveal how they created the formidable family enterprise that is now threatening to crumble. Early on, Conigliaro, a civil engineer who served in the Massachusetts Air National Guard, displayed talent for high-risk business ventures. His first company, though, had nothing to do with pharmaceuticals: He made his initial fortune with trash. Just a few years after graduating from Tufts University in 1987, he founded a recycling business in an old industrial building on Waverly Street in Framingham after realizing that recycling could soon ­become a booming business. Conigliaro started in 1990 with just a used U-Haul and credit cards, with which he racked up $42,000 in charges. But the company, Conigliaro Industries, quickly started making money by finding new uses for trash nobody wanted. It converted detergent bottles into recycling bins, molded Styrofoam lunch trays into flower pots, and turned plastic computer casings into pothole filler. By 1994, Conigliaro was successful enough to be spotlighted in The Boston Globe as an up-and-coming entrepreneur. Conigliaro brought many family members into his recycling business, including his mother and his father, an ­inventor who codeveloped a machine that shreds leaves. The business also includes an aunt. He soon branched into real estate as well, starting GDC Holdings Inc. and GDC Properties Management LLC, which owns the large Framingham complex where the recycling business was launched. It was not long before he turned his sights to the pharmaceutical business, an area his sister Lisa and brother-in-law, Cadden, knew something about. Since getting married at St. Mary’s Catholic Church in Holliston, Mass., the couple had been busy raising three children in a renovated antique barn house in Cumberland, R.I., and working as pharmacists, neighbors recalled. They saw them as hard-working and devoted parents. Lisa began showing some entrepreneurial spirit of her own, filing for a patent for a product called Comfy Cuff, a cushioned sleeve for a nursing mother to wear to provide extra comfort for her baby’s head. In 1998, Conigliaro and Cadden founded New England Compounding in the same Framingham building Conigliaro already used for his recycling factory and real estate businesses. Like the other ventures, New England Compounding was a family affair. Gregory’s sister-in-law Carla Conigliaro, a nurse, was initially listed as the company’s president. Cadden’s wife was also on the board, listed as Lisa Cadden Conigliaro. A former employee of New England Compounding, Carrie-Lee Touhey, recalled Gregory Conigliaro as the consummate businessman who provided the financial expertise, while ­Cadden was the sunny pharmacist who always had “a smile on his face.” Conigliaro normally wore a shirt and tie, while ­Cadden wore blue hospital scrubs, she said. New England Compounding was not your typical neighborhood pharmacy. Instead, it ­focused on compounding, mixing the ingredients of medications in new ways for individual patients. For instance, a compounding pharmacist might create a liquid version of a pill for children or substitute an ­ingredient for patients with an allergy. Richard Sawyer, who sold his Rhode Island summer home to the Caddens a few years ago, recalled Barry Cadden talking about being a pharmacist and initially specializing in cancer drugs, then broadening into other areas. In fact, nationwide, the market for compounding drugs started growing because of shortages of some common drugs, such as morphine and certain antibiotic injections; increas­ing use of medications for pets; and greater diagnoses of childhood allergies. “Compounders become the only ­option,” said David A. Ball, president of Ball Consulting Group in Newton. Cadden and Conigliaro soon brought in a new family member to help market their drugs and services. Conigliaro’s older brother Douglas, a doctor who specialized in anesthesiology and pain management, had been disciplined by the Florida medical board in 2002 after ­allegedly puncturing a woman’s spinal cord during surgery while inserting a catheter for pain medication. The woman was paralyzed, allegedly because of the procedure. Douglas Conigliaro was ordered to pay a $10,000 fine, but did not admit guilt. The doctor led a new company in the Framingham building, now called Medical Sales Management Inc., to provide advertising and marketing services. As the sales arm for New England Compounding, ­Medical Sales promoted the compounding business at trade shows across the country, and its sales force aggressively worked the phones, cold-calling new customers and reaching out to existing ones. It also helped manage the company’s computer operations. The compounding business apparently proved so successful that the families decided to ­expand their empire. In 2006, Conigliaro and Cadden launched Ameridose, which was initially located in the same Framingham complex. Former workers said they found a new opportunity, selling a much-needed service to hospitals: prefilling syringes and breaking down vats of liquid medications into smaller intra­venous bags for individual treatments. The new company either prepared the medications or bought them elsewhere. And unlike New England Compounding, Ameridose had a manufacturing license from the US Food and Drug Administration, allowing it to ship medications in bulk without obtaining individual prescriptions. Historically, hospitals did much of that work themselves. But new federal regulations required hospitals to go through more elaborate steps to handle sterile preparations, making it more costly and complicated. Moreover, health care providers have been under growing pressure to reduce costs by outsourcing work wherever they can, creating a huge opportunity for the new firm. Two years after it started, Ameridose added a second ­location, leasing a 76,000-square-foot building in Westborough. It later leased two neighboring buildings on the same block, its growth driven in part by its sales force at Medical Sales Management, who flew around the country visiting hospitals and doctors. Ameridose officially changed its main address from Framingham to its new base in Westborough last year. Between 2008 and this year, Ameridose went from 50 workers to close to 400, according to federal contracting records. New England Compounding ­also grew rapidly, with its head count more than doubling to about 50 employees over the last three years. Meanwhile, Cadden and Gregory Conigliaro started yet another company, Alaunus Pharmaceutical in Framingham, to distribute generic drugs three years ago. Both Cadden and Gregory Conigliaro seemed to thrive ­financially. In 2010, Conigliaro bought a sprawling $3.5 million home in Southborough with six bedrooms, nine bathrooms, and more than 11,000 square feet. He also bought a vacation home in Barnstable in 2008. Meanwhile, the Caddens built a $1.8 million home in ­Wrentham in 2005. About three years ago, they also purchased and renovated a beach home in North Kingston, R.I., a place with stunning views of Wickford Cove that was featured in Rhode Island Monthly magazine in August. Conigliaro, the more high-profile of the pair, became politically active. Last month, he and his wife hosted a fund-raiser for US Senator Scott Brown at their home in Southborough. Instead of ­political donations, Cadden’s giving focused on education, includ­ing his alma matter in Rhode Island and his children’s parochial school, which he gave at least $5,000, according to the schools’ websites. Some of the firms’ former workers say they saw a downside to the rapid growth. Ameridose warned prospective hires that it needed “high-energy” workers who could regularly work weekends or evenings. “The environment is very fast pace,” the company said in recent help wanted ads. Several former workers said the company suffered from high turnover and pressure to meet orders. Two former co-workers said some employees spoke little English, increasing the possibility of critical errors. A pharmacist who worked at Ameridose said she quit in 2009 after the company decided to try using quality control workers, rather than highly trained pharmacists, to make sure the right drugs were present before filling intravenous bags. Ronnie Leger, who worked in packaging at Ameridose, said he was also concerned about the hectic pace and safety. For instance, when sterile syringes and drugs fell to the ground, he said workers sometimes picked them up, quickly wiped them off, and shipped them anyway. Leger said he was fired last year after he complained about the safety practices, including workers being exposed to noxious odors one day. He said he filed complaints with the FDA and the Occupational Safety and Health Administration. A spokesman with OSHA confirmed it has an active whistleblower investigation into Ameridose, but would not provide details. The companies occasionally asked people in sales to help pack shipments when they got backed up with orders, according to a former Medical Sales Management sales representative. The Globe interviewed a half-dozen former employees of the companies, many of whom asked not to be named because of legal agreements with the firms or fear it would harm their careers. One said the companies cared about safety. Regulators also found problems. An FDA inspection of Ameridose in 2008 found ­numerous issues, including that the company did not fully test all the lots of its drugs and shipped some lots before receiving the results of sterility tests. Ameridose recalled a painkiller shortly afterward because it was overly potent. And a group purchasing company, Novation LLC of Irving, Texas, told customers it planned to sever its ties with Ameridose at the end of this month because of concerns about the company’s quality controls. Novation agreed to extend the contract after Ameridose sued Novation for slander and other issues. Meanwhile, New England Compounding had issues of its own. A patient in upstate New York died of meningitis after receiving a tainted anti-inflammatory shot made by the company in 2002, according to a 2004 lawsuit filed in Monroe County in upstate New York that was later settled. And state and federal regulators launched an investigation after receiving complaints about the firm, leading to a consent order from the state and an FDA warning letter in 2006 detailing a number of issues, includ­ing concerns about ­potential microbial contamination from splitting and repackaging the injectable colorectal cancer drug Avastin. Finally, the safety concerns exploded into the headlines this month after a growing number of people were diagnosed with fungal meningitis traced to a possibly contaminated steroid shot typically used to treat back pain. Federal safety inspectors are examining the possibility that other drugs from the company may also have been contaminated. New England Compounding agreed to suspend its operations two weeks ago. Cadden has also temporarily agreed to stop practicing pharmacy in Massachusetts, though his ­license remains in good standing in neighboring Rhode ­Island. In addition, Ameridose and Alaunus agreed to temporarily suspend their operations for two weeks while federal and state inspectors review the ­operations. Still, the Caddens and Conigliaros have not given up on restarting Ameridose soon. The company’s public relations firm has gone to great pains to insist that Ameridose and New England Compounding are separate companies with distinct management teams and facilities, even though they were both owned by the Conigliaros and Caddens. Until recently, both companies had space in the same complex on Waverly Road in Framingham. And even today, they have adjoining mailboxes at the property. Cadden, the president and main pharmacist at New England Compounding, was also listed as comanager of Ameridose in the company’s annual report with the secretary of state in Feburary. “I don’t think there was literally any difference,” said the former Medical Sales Management worker who handled sales for Ameridose, while a colleague at the next desk took ­orders for New England Compounding. Now federal and state investigators are probing the ties ­between the two firms. The problems appear to be taking a toll on the families, and those who know them ­insist the crisis must devastate them emotionally and financially. One neighbor said the Caddens have since retreated from an offer to buy a new waterfront vacation home in Rhode Island, valued at about $1.3 million and only a few blocks from their current beach home.